After all the food that was consumed last weekend and finishing up leftovers, I have been trying to eat “healthier” food the last couple of days to some what detox my system. And by detox I don’t mean completely cleanse. I am pregnant that would be ridiculous but trying to put more good in than bad. Bump up the fiber and eating more nutritious and lean food. We went to the doctor on Tuesday my weight went up more than I would have liked. The doctor didn’t say anything about getting into the danger zone or putting on too much weight too quickly, so perhaps I’m still okay. Within the last 2-3 days, I’ve made baked chicken teriyaki w broccoli and asparagus stir fry and penne with asparagus and tomatoes (using whole wheat pasta of course for the added fiber) in an attempt to use up some of the veggies on the veggie platter (the remainder of the veggies like celery and carrots, I’m snacking away on with some TJ’s hummus). We also have a ton of fruit from our fruit platter that I’ve been chipping away at. 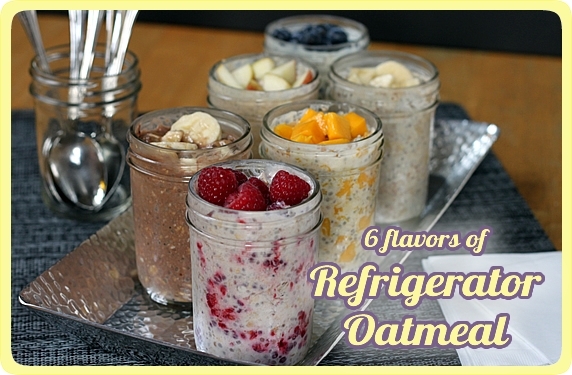 I have my usual cereal or yogurt with berries in the morning, but the other day I came across a pinterest post for overnight no cook refrigerator oatmeal. As you may know, I am big into having a breakfast full of fiber plus I hate having to cook oatmeal in the morning, so I figured out why not try it out. I had all the ingredients anyway. I put the main ingredients in and mixed in strawberries, blueberries, honey, and vanilla extract. It was quite tasty. The texture is similar to museli as it has that soft chewy aspect. Next time, I’d add toasted nuts to oatmeal minutes before eating for added good fats and overall texture. I’m thinking about trying the mango or chocolate banana next. Again, like my previous oatmeal post, flavoring combinations are endless and up to you. Note: Images used in this post that are not mine are linked back to the original source and post.